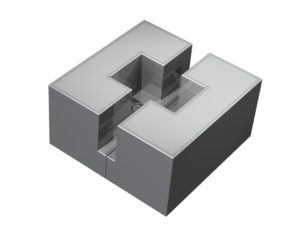 Dexter Magnetic Technologies has designed and produced a large variety of permanent magnet static field sources for MRI/NMR applications, some based on our current quadrature magnet patents and others so unique that patents have been applied for. Magnetic Resonance Imaging (MRI) was known as Nuclear Magnetic Resonance (NMR) until the ‘nuclear’ connotation became unpopular, but both names denote the Magnetic Resonance (MR) principle involved. Besides the MRI machines one finds in hospitals, magnetic resonance devices are commonly in devices used to ensure proper chemistry / material mix, such as equipment used to monitor quality of asphalt. MR detects an atom’s gyromagnetic ratio, the ratio of the magnetic dipole moment, due to nuclear spin, to the mechanical angular momentum, to discriminate between elements. Almost every element in the periodic table has an isotope with a non zero nuclear spin, but to be useful the isotope must also be abundant in the volume being analyzed. Therefore, the nuclei of interest in MRI of the human body and other living organisms are those of hydrogen, carbon, nitrogen, sodium, phosphorus, potassium and calcium. In operation, protons in the sample volume are oriented by the static field, and caused to precess by the alternating RF magnetic field. When power to the RF coil is turned off, the magnetic moment of the protons realigns with the static magnetic field. The energy change involved in realignment of the magnetic moments is measured as a small RF signal by the antenna coil and a Fourier transform of signal frequency and phase produces data used to construct a distinctive image. Data for each atom/molecule depends on the atoms present and the surrounding molecular structure. This allows MR to differentiate liquids from one another, or a liquid from a solid, making the technique useable for quality control processes. The static magnetic field strength required depends on the element being imaged and the desired resolution. Fields as low as 0.02 T have produced useable hydrogen images, but 0.08 – 0.1 T is more common for quality control work. Higher flux densities are needed for greater resolution and other elements, so laboratory superconducting systems with fields of 1.5 to 4.7 T are in use. 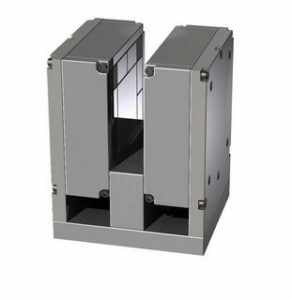 Magnetic field strength uniformity also affects resolution, so magnetic field static sources with uniformity of +/- 0.0001 mT are trimmed with trim coils, magnetic shims or trim magnets to obtain uniformity over the sample volume in the parts per million range. A permanent magnet source substantially reduces the power required by an MRI/NMR system and allows portability. However, higher resolution translates to higher flux density and uniformity across the sample, and this increases size and cost exponentially, so it is important to minimize the sample volume and be realistic about the desired resolution when designing a system. 1. What level of field uniformity do you need? 2. What is your field region of interest? 3. What field magnitude do you require? 4. What is the operating temperature of your system? 5. How much space is there for this system? We often use sintered Neodymium Iron Boron magnet material for its high energy. Samarium Cobalt magnet material is used when there is elevated temperature. I need a permanent magnet MRI that produces 2T. Can you build a system to meet my requirements? Yes we can. We would, however, need to know where you need the 2T and what level of uniformity you will need. Can you build a super conducting MRI magnet system? No we cannot. However, we can build permanent magnet MRI systems. Can you provide field mapping plots of the final magnet system? Yes we can. Let’s discuss the area you would like us to map and the grid pattern. 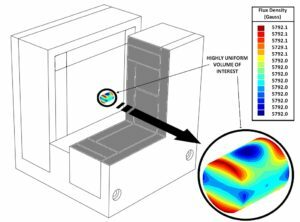 The design process involves computer modeling, evaluation of impacts on the magnetic field uniformity of various factors such as tolerances (geometrical and material tolerances) and temperature variations, and mechanical design. With our quick-turn prototyping, we can do an iteration of the design in a matter of days. .